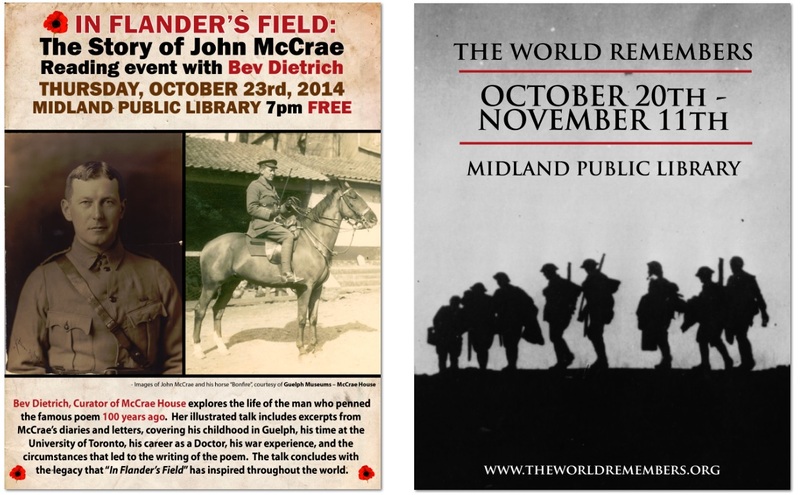 The Midland Public Library is hosting two different initiatives this Fall to commemorate the centenary of the commencement of hostilities. First, the Library welcomes visitors to a reading event with Bev Dietrich Thursday October 23rd, at 7 p.m. “In Flander’s Field; The Story of John McCrea“, Bev Dietrich, Curator of McCrea House explores the life of the man who authored the famous poem 100 years ago. Secondly, the Midland Public Library is joining with an initiative called “The World Remembers” which is being organized by a group in Toronto and which follows on an effort these same people made about 6 years ago that saw the names of Canadian dead projected on the walls of schools and institutions across the Country. This year they are starting a 5 year project to memorialize all the people who died by asking participating institutions to mount a display that can be seen from the street that will list all the names of those who died from all the Countries involved starting on October 20 and ending early morning of November 11. There is participation in a dozen other Countries as well as across Canada. This year the names of those that were lost in 1914 will be shown. The program highlights the names of Canadians, displays the names from other Countries and features photographs from the front throughout. To supplement this project, that runs each night, our local High Schools are contributing electronic files of research successive classes have done on many of the people from here who served. The Library will run these during the day inside the Library. More information on these initiatives can be found at the Midland Public Library, 320 King Street, Midland, their website or by calling 705-526-4216.